School’s out! Jenn McGlon knows what’s coming up next! 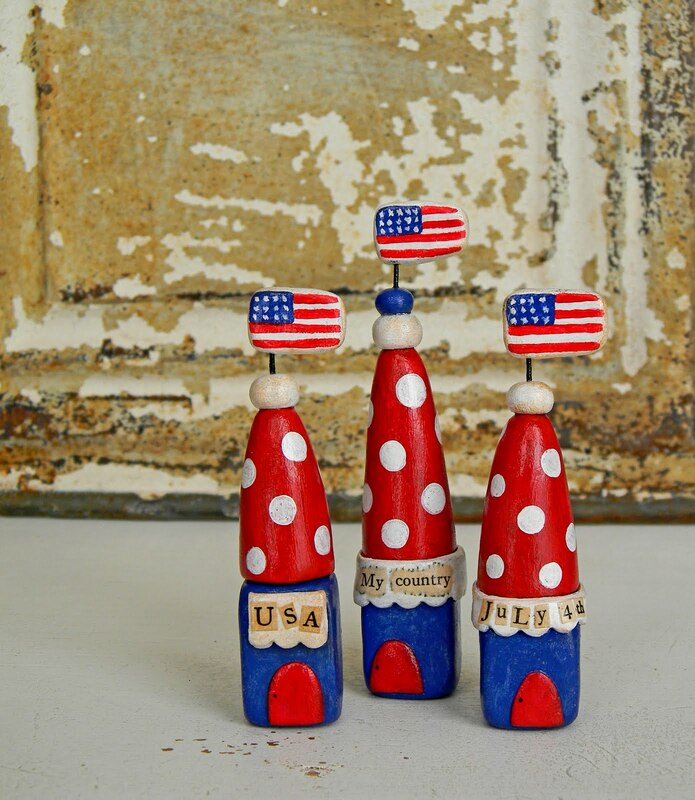 She and her friends over at SpookyTimeJingles are already gearing up for the Fourth of July with an offering of Americana art like these painted polymer Luettes. The Spooky folks have jumped ahead to their favorite fall holiday as well. A new, air dry polymer clay? DeCoRé is quite pricey but might be just the thing when you want to add inclusions that can’t take the heat of baking. Read more. Ronna Weltman sent us the link. Julie Picarello’s new book, Patterns In Polymer, is a joy to read and to learn from! The copy is engaging and the techniques are dynamite. The Green issue of the From Polymer to Art quarterly magazine has arrived. For U.S. readers, PolkaDotCreations carries this Netherlands publication. It is wonderful to see Julie Picarello’s book endorsed and introduced once more. It was a purchase that was worth every penny and more. When it comes to sharing and instructing, Julie is a great and generous (even clay color recipe are included! how awesome is that!) author. The language is easy to understand, the step by step simply encouraging for both amateur or skilled clayers. That air dry polymer clay sound interesting. I’ll have to check it out. How strong will the air-dry be? I make a lot of figurenes which sometimes have small parts. I have to agree that Julie Picarello’s book was fabulous–I absolutely loved it and thought it was worth every penny. Her “jecru” recipe is neat, along with her other color recipes, and, of course, the MG technique the book taught was wonderful.